Embakasi East MP Babu Owino and Starehe lawmaker Charles Njagua aka Jaguar. 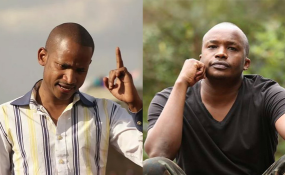 Nairobi — Embakasi East MP Babu Owino and Starehe lawmaker Charles Njagua aka Jaguar were involved in a scuffle in Parliament Buildings Tuesday afternoon. The incident took place in the media centre after Njagua walked in and accosted the Embakasi East MP who had come in to book a media briefing. Njagua who was accompanied by another MP, tried to wrestle Babu while accusing him of demeaning President Uhuru Kenyatta. It took the intervention of the Media Relations Officers to break up the two, while the third MP in a blue suit shouted,' Babu lazima utaheshimu President wetu. "Huyo Uhuru ni care-taker President!" Babu retorted. The scuffle ensued outside the Media Centre where parliamentary orderlies intervened and separated the two first-time legislators.